Amid a majestic backdrop of vineyards and mountains, the Sonoma House is an idyllic setting for savoring Patz & Hall's renowned Chardonnays and Pinot Noirs. From our luxurious Salon, where guests enjoy private seated tastings to our charming drop-in tasting bar, the Sonoma House embodies the essence of wine country hospitality. 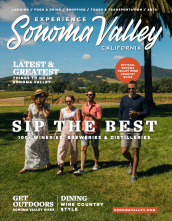 Discover why Wine & Spirits named us one of the world's "Top 100 Wineries" six times in twelve years! Open seven days a week, from 10am-4pm.